Our RAID makes achieving the redundant protection of your data easy to accomplish. With every Drobo you get the redundant protection of much more expensive storage in a format you don’t have to configure or manage. BeyondRAID technology, built into every Drobo, delivers all of the benefits of traditional RAID, but leaves the limitations and complexity behind combining enhanced protection, reliability, expandability, and ease-of-use. 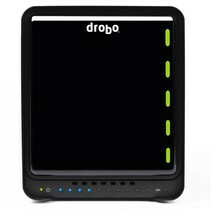 Drobo is the easiest to manage storage solution available. You can purchase the capacity you need now and increase space by adding additional disk drives, or by just swapping smaller disks with larger ones later. If a drive fails, Drobo automatically protects data without user intervention. In addition, when you do add capacity, it is instantly available so you never have downtime. 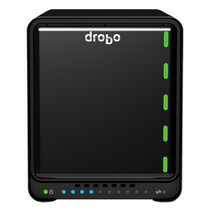 Drobo even protects against one or two simultaneous drive failures with just one click. 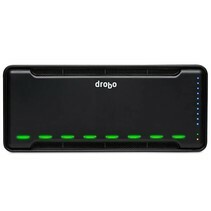 Just plug in your Drobo and rest easy knowing your data will be protected right out of the box. Add disks at any time for additional protected capacity. Drobo can even solve problems by itself. Lights on the front tell you what’s happening – if you can read a traffic light, you’re already a Drobo expert. Take a look at the lights on the front of a 5-bay Drobo. They work the same way on all Drobo models.